Aging and skin damage are often talked about, but rarely understood. Age and imperfections are not s inevitable as once thought. Elastic skin itself is problems appear to be reversed and surface function recoded to help get visible results. TRUTH: A wrinkle or imperfection is like a scar or wound. It is the body's physiological response to injury. HOW CELLURE WORKS: The Cellure system marries skin’s normal functions to dispatch powerful growth factors and proteins from our exclusively formulated Lipotein™. They naturally seek out damaged areas to help repair skin and restart its own inherent regeneration. As a cut seals or a burn heals, so is age un-wound. I was given the opportunity to try out the sampler starter kit on myself. I tested out all of the 6 products. A little bit goes a long way and the mini samples lasted me about 3 days. After examining my skin from the first day, I did noticed only minimal changes with my skin's elasticity. It's gentle that it doesn't irritate my sensitive skin. I like how it is non-greasy too. The main area I wanted to concentrate on is more around the eyes. I always tend to look sleepy with dark circles. The Cellure Rework helped a little. I can't really tell much since I only used it for short time, but I am sure using the products (following the 5-step regimen) over a longer period of time will dramatically increase my appearance. I tried taking before and after pictures, but lighting was bad and couldn't see the details. Well I tried! 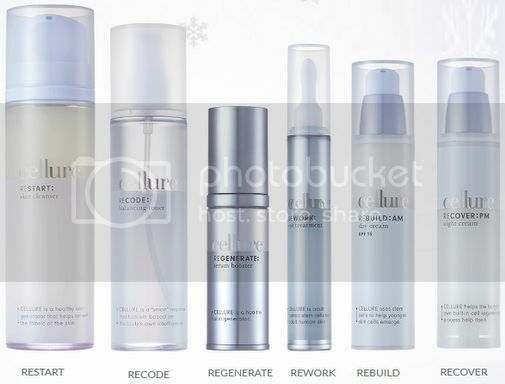 CELLURE offers a comprehensive, insight-driven approach to the complex factors of skin aging and correction. 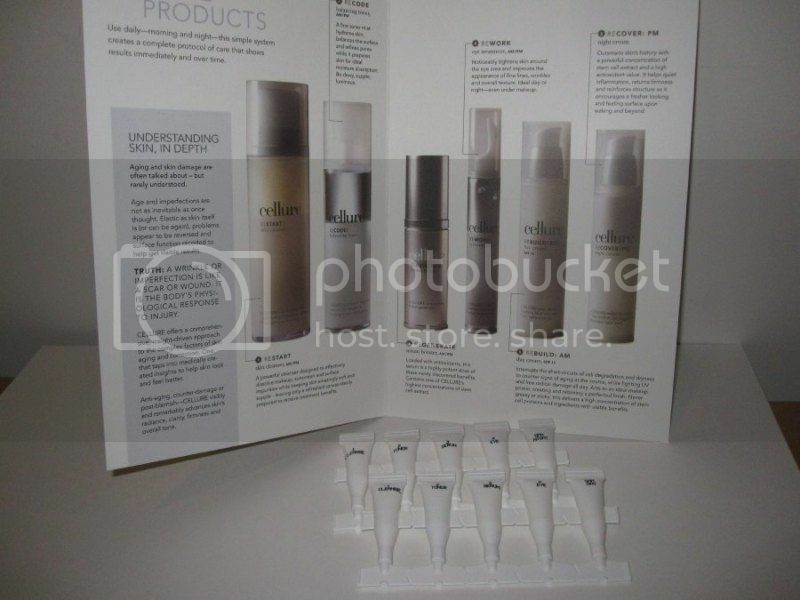 One that taps into medically created insights to help skin look and feel better. Anti-aging, counter-damage or post-blemish... Cellure visibly and remarkably advances skin's radiance, clarity, firmness and overall tone. A powerful cleanser designed to effectively dissolve makeup while keeping skin amazingly soft and supple leaving only a refreshed canvas ideally prepared to receive treatment benefits. It gently cleans all the impurities from skin. A fine toner mist hydrates skin, balances the surface and refines pores while it prepares skin for ideal moisture absorption. It also provides the skin a fresh, clean feel. Loaded with antioxidants, this serum is a highly potent does of these newly discovered benefits. It contains one of Cellure's highest concentrations of stem cell extract. Noticeably tightens skin around the eye area and improves the appearance of fine lines, wrinkles and overall texture. It is idea for day or night, even under makeup. It interrupts the short-circuits of cell degradation and dryness to counter signs of aging at the source, while fighting UV and free radical damage all day. It acts as an ideal makeup primer, creating and retaining a perfected finish. It's non greasy nor sticky and delivers a high concentration of stem cell proteins and ingredients with visible benefits. Disclosure: I received single use samples in exchange for a review of this post. I was also provided info from the PR firm to share. Any expressed opinions are my own and personal thoughts. No other compensation was given. Your blog is so useful for everyone. You have great collection about beauty tips. This product help the skin look and feel better.